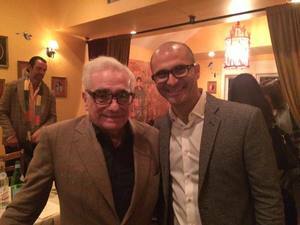 Martin Scorsese and owner Francesco d’Ippolito. Auguri to Poesia in the Castro, who got to host the iconic ~Martin Scorsese~ for a private dinner and buyout in their restaurant after his screening of his movie, Silence, at the Castro Theatre. Marty came with lots of VIPs, including George Lucas, Adam Driver, Andrew Garfield, Issey Ogata, and Thelma Schoonmaker. Owner Francesco d’Ippolito said they prepared a special Sicilian-style menu, which included arancini, grilled calamari salad with delicata squash, pickled currants, and chile; pasta con le sarde; roasted branzino with eggplant caponata; and, of course, cannoli for dessert. Fun fact: he really liked the food and the fact they were playing Fellini’s 8 1/2 on the wall (according to his editor Thelma Schoonmaker, it’s one of his top five favorite movies of all time). Wild-eyed ~Hunter Pence~, beloved San Francisco Giants outfielder, celebrated his wedding reception at EPIC Steak on Saturday, November 26. Hunter and his bride, Alexis Cozombolidis, hosted a “Harry Potter meets Game of Thrones“-themed reception (the mind reels). Some high-profile guests included Larry Baer, Bobby Evans, Sergio Romo, Brandon Crawford, George Kontos, Joe Panik, Brian Sabean, Matt Duffy, Greg Miller, and Melvin Gutierrez, among others. You may recall a few years ago, Pence’s beloved scooter was stolen outside of EPIC Steak, which the restaurant team helped him recover, but no, the new couple did not scoot away after the reception.